For example, you may want to compare how the email performs under two different subject lines when sent to the same audience, or an email that is sent with two different aliases. This enables you to determine how best to create your email for maximum engagement. As with any campaign you need to have an audience group set up, and an email created. If your split test is testing an aspect inside the email design you will need to have two separate emails created. Otherwise you can have one email made for your campaign. In this example we will be looking at how different subject lines change recipient engagement. Once you have your email design ready and your audience group created, you can start creating your campaign. From the campaign dashboard set up your basic campaign details. Add your audience group in to the Audience tab. Remember to count your audience straight after you have attached the audience. 1. Select "Split Test" as the email type. This will cause the screen to expand and present further options. 2. Sample Size can be done by actual or percentage. If you have 100 audience members and you choose percentage as 50%, it will send Design 1 to 25 people, and Design 2 to 25 people, only using 50 out of 100 contacts. But if you choose "Actual" you can put the size as 50, which is the same doing the above. 3. Send Method allows you to customise how the split test will send. Manual = This allows you to send the email depending on your own set date and times. AutoSend = This gives you the option of setting day and hours in which the email will send. Please Note: With AutoSend you can only monitor open rate or click through rates. For this reason we recommend using Manual send. For your Split Test you will have two designs. This doesn't mean your email design itself has to change, you can have the same exact email attached but the Subject Line may be different. In this example the subject line has changed, with the email staying the same. 1. Select your email to add. Do this for design one and two. 2. Provide an Alias for the email. This is what will appear in the recipients web browser as the page title, if they click on the 'view in web browser' option. 3. Set up a Sender Alias. This will override the default you have set up in System Defaults. 4. Add a Subject Line. Here the subject line is what we are testing for our split test. Follow these steps for design one and design two. In Design 2 we have used a Custom Field for our Subject Line. We have the regular text, with a First Name custom field. In the email this will display the recipients first name, but you can choose any custom field you wish. When you have checked all the required details are correct, the email designs chosen are correct, and that your split test is correctly set up, you can need to use the Send test function. Sending yourself a test means you can see any errors in the HTML and Text version of the email. You can choose to test only HTML or Text, but we recommend testing both as some clients may not receive a HTML version. Once you are happy, click "Save and Initiate" to send your campaign. In this initial results screen you will be able to see Design A and Design B (Design 1 and Design 2). The stats for these are displayed above if you used manual send. 1. Here are your emails subject line and name. 2. This icon allows you to export an Excel file of specific data sections. 3. Once you have decided which design was the most successful, you can choose which design to formally send by clicking on the Initiate A or Initiate B buttons. Once you have initiated a specific design and recipients have access to the email results will start to appear in the campaign results section. The results from the winning initial split test email you chose will be included in the final results. 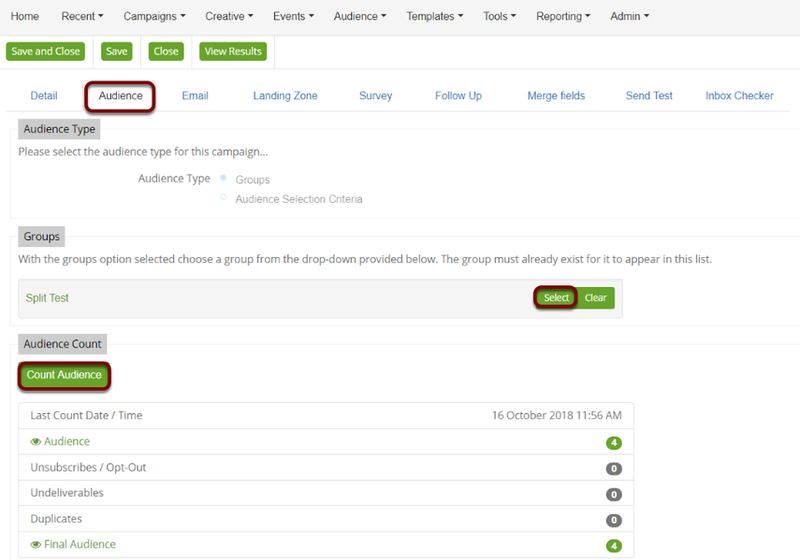 If you wish to see the initial split test results again you can click on the "Split Test" tab within campaign results which will appear regardless of whether you choose manual or auto-send.